Military and Spanish liberal politician, born in Santa María de Tuñas (Asturias), 24 October 1785 and died in Madrid, November 7, 1823, after being run by the absolutist forces of Fernando VII, in the square of the barley. Born in a family of the minor nobility, his father was Antonio Eugenio of the irrigation Núñez, writer of some standing. He/She studied at Oviedo the first letters and latinity, and later received bachelor's degree in philosophy. It did not however graduating, as of May 23, 1807, prior record of blood cleaning, joined the American company of troops from the Real person, which took part in the mutiny of Aranjuez, on March 17, 1808. Confined to Aranjuez after the Dos de Mayo by disobeying the orders of Murat, he/she decided to merge in Asturias, where his father was a member of the Supreme Board of the Principality, to fight against the invader. The trip took an incident in Villalpando (Zamora), where taken by French spy; but fortunately the misunderstanding could be resolved. The 8 August 1808 the job of Captain of the regiment of infantry of Tineo, was given and shortly after he/she was appointed assistant general Vicente Acevedo, who was found at the battle of Espinosa de los Monteros, 10 and November 11, wounded 1808.Gravemente Acevedo, irrigation tried to save him, but 13 was taken prisoner by a split enemy that topped the General. It was in Dijon, Autun and the deposit of Chalons over five years. These are the years that meant starts up his liberalism; However, it does not seem to have been so. His liberalism stems from the tradition of his family and the objective and subjective conditions of his life, including captivity: but not by contagion from the prison, but by own maturation of his spirit. In 1813, he/she managed to escape, returning to Spain by Lyon, Switzerland, banks of the Rhine and Rotterdam, where he/she arrived on January 10, 1814, Harwich, where on 20 February 1814 asked permission to go to London, London, indeed, Plymouth, where it embarked for Corunna in command of a tank of Spanish refugees. It arrived in time swearing the Constitution before the general Lacy. Although it is assumed that no coup liked him, in August 1814 was assigned to the regiment of the Princess, 2nd line, and on February 6, 1815 received the Medal of suffering for the country. Reportedly, already at that time was a mason, and participates from Madrid in conspiratorial activities. 1815 or 1816 he/she translated a book of Napoleonic theme, although as has come down to us the manuscript, we can not know the author, nor when it published the original nor when exactly was the translation. February 2, 1817 was assigned as a senior, at his own request, to the army of Andalusia. In Cádiz you were acantonando troops that should go to America to put an end to revolutionary outbreaks that occurred there, but these troops held a strong discontent. In these circumstances they arrived at Cádiz official from America which advocated a restoration of the Constitution of 1812 as the only way to solve the problems in Spain and America. With these ideas began to harden the conspiracy, in which irrigation pledged from the outset. Committed to the revolution, he/she could not help in 1819 the imprisonment of the most important entreated by the treachery of Enrique O'Donnell, count of La Bisbal. But the conspiracy followed its course, despite the setback, especially since irrigation dared to act, and on January 1, 1820, at the head of his battalion of Asturias proclaimed the Constitution in las Cabezas de San Juan (Sevilla), proceeding immediately to the investiture of the constitutional mayors who had been arbitrarily dispossessed in 1814. Although obviously was not the only, or even the most important or the higher ranking participants in the movement, the fact that, before the bad luck of some or the inaction of others, appeared as the only in dare, gave him immense popularity, as few people have ever had in Spain. It belonged successively to the patriotic societies of Seville, where he/she was President, on 24 April 1820; nato partner of Fontana, and Pamplona, President of San Fernando, all of them in 1820; and Valladolid, September 9, 1820; Zaragoza, on July 27, 1821; Alcañiz, Calanda, Caspe, in August 1821; Barcelona, on January 13, 1822; Valencia, February 1, 1822; Córdoba, on October 18, 1822, President of La Carlota, in October 1822; and the Landaburiana, between November 10, 1822 and January 1, 1823. Its discreet character, its tino at first politico-military decisions, and no personal ambition, never claimed power for himself, probably joined the persecutions he/she suffered, they worked the wonder of become you a symbol, even in life and much more after his death, symbol of the Spain wanting to emerge, symbol that has survived to this day with his famous hymn. Irrigation tried to avoid this huge responsibility, but knew how to be true to itself and what marked her destiny. Hence its greatness. In a daring coup, January 2 made prisoners in arches to the general Salvador Sánchez, to white, to brigadier Gavani sub-inspector and general Blas Fournas, but understanding that inaction would be fatal, acting as a guerrilla leader, 27 January undertook a March by Andalucia with his small army, which ended on March 13, when already hurry sought the Portuguese in order to escape certain death border. But this March, in which many men lost by desertion and very few joined you, despite the general sympathy that enjoyed in the country, pursued as it was by general José O'Donnell, was fundamental for the revolution, since the news of what was happening in Andalusia, enlarged by anxiety, lack of information and hopespread everywhere, giving rise to the new standards to which the king bowed to accept the Constitution. With the triumph of freedom, Quiroga, irrigation, Arco-aguero, López baths and O'Daly were promoted to quarterbacks, and though irrigation was the only one to reject such rise, won you from the Government. He/She was also named aide-de-camp of King, and received the Grand Cross of San Fernando. From the first moment irrigation army had adopted the title of national, and after acceptance by the King from the Constitution with the troops who had taken part in the Constitutionalist insurrection, the so-called army of the island (de Leon) was formed. Irrigation was appointed captain general of Galicia, who did not occupy, because in August the Marquis of the yellow, under the pretext of economic problems, dissolved the army from the island, leaving defenseless to the revolution. Irrigation was the weakness of moving to Madrid to defend his army; in Madrid he/she was received in triumph, but the Government complicated him in the famous incident of the theatre, on 3 September of 1820, where he/she said that he/she had sung the swallow, and as a result will not let you talk before the courts and was immediately dismissed from all his positions and sent from Headquarters to Asturias. Beset by some members, Romero Alpuente in the first place, and Argüelles, than at the famous meeting of September 7 threatened to open the pages of this story, which involved a veiled accusation of republicanism. Anything they earned representations of the interested party so that it would do him justice. Reconciliation between moderate and exalted at the end of 1820, as consequence of the conduct of the King, earned him to watering your new appointment of captain general of Aragon, the 28 of November of 1820. It became the capital of Aragon on January 8, 1821, and there began to write a relationship empenada occurrences from the first of January 1810 until the oath of the Constitution, which did not conclude, and which has been lost. Was married by proxy to his cousin María Teresa del Riego and irrigation on October 15, 1821 (the marital power was the date of July 18), he/she denounced the activities of the servile, toured the region to counter them, but it was the victim of a new intrigue, on August 29, 1821 was dismissed and sent from Headquarters to Lérida and Castelló de Farfanyaprisoner on wires drawn by its successor, the political Chief Francisco Moreda (again the indirect accusation of republicanism through the alleged conspiracies of Montarlot and Villamor Cugnet). Its popularity was such that, through the streets of Madrid, walked his portrait. Nothing they again earned the representations of the persecuted, calling for justice. In 1822, he/she became President of the courts, thanks to the popular support; from this position he/she presented in Congress their grievances against the former Minister Ramón Feliú. A list of the CPA gave the Masonic name of Washington. 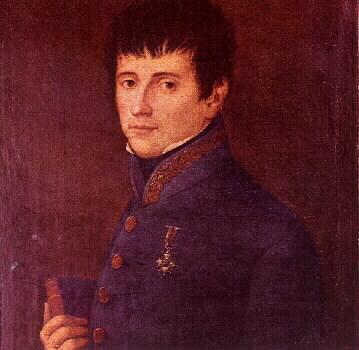 Member of courts by Asturias, 1822-1823, was President of the same in March 1822. In a document without the date of the CPA appears as a Venerable of the first tower of the Communards, Geronima conception Street, 8, fourth 1. He later fought for freedom in Madrid on July 7, 1822, and upon the invasion of the hundred thousand sons of San Luis 7 April 1823, went to the courts, in may, an important exhibition, 24 June he/she was given command of the 2nd army of operations, command removed 27. On 18 August appeared in Malaga at the head of the third army's operations, which was faced with invasion, but was general delfracaso regime sinking, and in particular of the betrayal, double betrayal of Ballesteros. September 14, 1823 took refuge in the farmhouse of the granary, near Torre Pedro Gil (Jaén), from where a few guides led him to small arches, whose Mayor made him prisoner. The French, who in other cases prevented the absolutists in this no crimes did nothing, as if I complaciese them the disappearance of the hero. Neither Chateaubriand did nothing when Miguel del Riego resorted to, in order to avoid the disastrous end. Born Rafael Madrid, locked up in the first seminar of Nobles and prisons of the Crown and the Court then became a sham trial, in charge of Sala Mayor Alfonso Cavia, who sentenced him to death for having voted as a member of the temporary removal of Fernando VII, and later quartering, denied the firing squad that was as Marshal. The sentence was fulfilled in the plaza de Madrid barley November 7, 1823, but not shown were quartered. Large audience witnessed the spectacle, and kept a daunting silence. The crying crowd belongs to a later legend, or is at least not in the contemporary versions of the assassination. Also seems a fake retraction of irrigation, dated the day before his death. Although with the implementation of irrigation just a whole era, and in his misfortune is also national misfortune symbol, its name fame survived him, and has remained alive until today, driving the best efforts of the Spanish people. The anthem of irrigation: soldiers, homeland calls us to the lid, juremos overcome or die by it, became the Holy and sign of various progressive movements in contemporary Spain. Archive of the courts (leg. 44, exp. 199 [data provided by Juan Bta. Vilar]). Archivo General de Palacio (roles reserved 67 and 87). ASTUR, e. irrigation. Historical-political study of the revolution in the twentieth year. Oviedo, 1984. National Library (ms. 12970-1). BURGOS, C. de. Glorious life and unfortunate death of Don Rafael del Riego. A crime of the Bourbons. Madrid, 1931. ESTEBAN, J. The anthem of irrigation. Madrid, 1988. FERNÁNDEZ ALVAREZ, M. Secret societies and the origins of contemporary Spain. Madrid, 1961. GIL NOVALES, A. Rafael del Riego. The revolution of 1820, every day. Madrid, 1976. -The Trienio Liberal. Madrid, 1980. -Patriotic societies. Madrid, Tecnos, 1975. GOÑI GALÁRRAGA, J. M. A documentary file unknown on the figure and the family of irrigation, "army, people and Constitution. 19th and 20th centuries. "Tribute to the General Rafael del Riego". Madrid, 1988. MENDEZ GARCIA, Z. Ever gold of prickly pear. I. documentary history of prickly pear. II. documentary history of irrigation. Luarca, 1932. PAEZ rivers, E. Hispanic iconography. Madrid, 1966. SÁNCHEZ MONTERO, R. Fernando VII: a controversial reign. Madrid, 1996. Suarez, C. Asturian writers and artists. Madrid, 1936.